The demands for display and processing of visual data in commercial, industrial, financial, aero-space and multimedia applications have led to the recent advent of powerwalls and hyperwalls. These arrays of multiple coordinated high-resolution flat-panel displays allow seamless visualization, integration, synthesis and pattern discrimination in complex and high-dimensional data spaces. Hyperwalls have recently been demonstrated by NASA and Apple and have since been gaining rapid adoption in multiple industry segments, including extreme gaming and digital signage. The multiple outputs may be tiled into a single composite super-display, or the different monitors may display separate fragments of the video data. The latter application is the main advantage of hyperwall systems over single big-screen monitors and projected displays, but even for composite single-image applications, hyperwalls offer a cost-effective and ergonomic alternative to projector screens with greater flexibility and ease of setup, adjustment and maintenance. These advantages, however, come with an added challenge of interconnecting the multiple displays comprising a hyperwall. The bandwidth requirements of high-resolution video displays push the limits of traditional VGA and DVI links. In addition, one needs to use multiple cables to connect the displays to the video outputs of a server, and these cables often need to be routed within a large physical area due to the size of the hyperwall array. Often, it may be impractical or even impossible to place the servers too close to the monitors. Therefore, the cables need to be fairly thin in order to be manageable, and they need to be able to support video data transmission across large distances (often more than 20 meters). Fortunately, the recent advent of the DisplayPort™ digital communication interface and the introduction of Q:Active active copper cable technology has given the industry a new attractive solution for hyperwall interconnects. DisplayPort is an innovative digital display interface developed by the Video Electronics Standards Association (VESA). It is a high-speed digital audio and video interconnect designed to be used between computers and display monitors. The original DisplayPort 1.1 standard supported one, two or four high-speed data pairs at the symbol rates of 1.62 and 2.7 GBps, allowing for a maximum video bandwidth 8.64 GBps. The DisplayPort 1.2 standard increases the maximum symbol rate per pair to 5.4 GBps for a total maximum video bandwidth of 17.28 GBps. Not only does this high bandwidth enable deep color digital video at resolutions such as 2,560x1,600 (WQXGA) at 60 Hz and the emerging 4K2K displays, but several other features of DisplayPort 1.2 make it particularly suitable for hyperwall applications. They include multistreaming (the capability to transport multiple uncompressed data streams over a single cable), the ability to interconnect several monitors in a “daisy-chain” configuration, as well as improved support for Full HD 3D Stereoscopic displays. In addition, the small form-factor Mini DisplayPort connector (originally developed by Apple Inc.) enables ultra-thin flexible cables well suited for laptop and netbook computers, as well as high-performance graphics cards with multiple densely-packed outputs. Also, while DisplayPort is not directly compatible with High-Definition Multimedia Interface (HDMITM), an optional Dual Mode support enables computers equipped with DisplayPort to drive widely available HDMI televisions, as well as DVI and HDMI monitors. 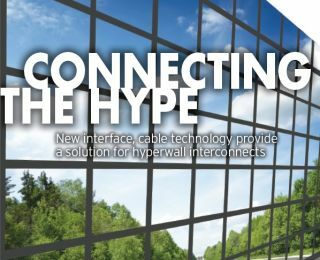 While the bandwidth and resolution demands of hyperwall interconnects are readily addressed by the DisplayPort standard, the need for ultra-thin and long-reach cables still poses a challenge. This is especially the case considering the fast serial data rates (2.7 and 5.4 GBps) involved. It is well known that the reach of a copper cable interconnect at high speeds is limited by several “channel impairments.” The most important of these is the frequency-dependent attenuation introduced by copper cables. This means that higher-frequency components of a high-speed data stream arrive at the far end of a long cable with severely reduced amplitude. Attenuation also increases in smaller diameter cables, due to the fact that electromagnetic losses are greater in conductors with smaller surface area. Other impairments include intra-pair skew (a misbalance of electrical propagation paths of the positive and negative pulse within a differential pair) and crosstalk (noise in the transmission channel caused by unwanted electromagnetic coupling of signals from neighboring pairs). The net result of these physical effects is that it is impossible to transmit high-speed electrical signals over very long passive cables (i.e., cables not containing any active circuitry). In fact, commercially available passive high bit-rate DisplayPort cables rarely exceed the length of a few meters. This clearly is an insufficient reach to be useful for connecting hyperwall displays. This problem of long cables has been effectively solved by with the introduction of active cable technology. By embedding small, low-power analog signal processing chips into the DisplayPort cable connector, it is possible to counteract the effect of all of the abovementioned impairments, restoring a pristine signal at the output of the cable. By doing this, one can transmit DisplayPort video data with the maximum bandwidth required by the 2,560x1,600 resolution displays over cables as long as 50 meters. The technology also enables the use of ultra-thin cables, making it particularly attractive for Mini DisplayPort interconnects. The monitors are driven with a high-performance Matrox M9188 octal graphics card (sporting eight Mini DisplayPort outputs each supporting 2,560x1,600 resolution at 60 Hz). Six of the eight outputs are used to drive the hyperwall with Q:Active active copper cables with Mini DisplayPort connectors on one end and a standard DisplayPort connector on the other. High-definition video clips and other high-resolution images are transmitted with stunning clarity, amounting to more than 50 GBps of aggregate video bandwidth. Hyperwalls are the new significant advance in the way video data is displayed and analyzed. Applications digital signage, include scientific, industrial and financial data displays, multimedia, entertainment and gaming. High bandwidth requirements and the need for multiple data streams make DisplayPort a great option for connecting the hyperwalls to computer video cards.